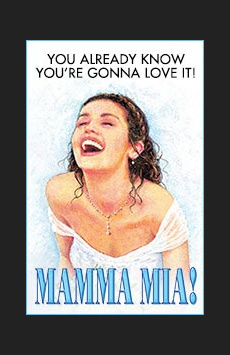 GIMME GIMME GIMME one last chance to see Mamma Mia! The sunny funny tale inspired by the music of ABBA will play its final Broadway performance on September 12, 2015. On the eve of her wedding, a daughter’s quest to discover the identity of her father brings back 3 men from her mother’s past. During the hit musical’s historic fourteen year run the Broadway blockbuster became an international phenomenon. See it again or for the first time.